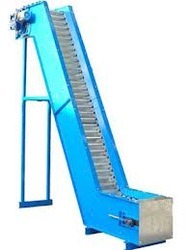 Pioneers in the industry, we offer bucket elevator conveyor from India. We offer Bucket Elevator Conveyor that is mostly used to carry products in a synchronized manner for various free flowing material like rice, wheat, corn, sunflower seed malt and many other products. These products are manufactured using best quality raw material and deploying advanced engineering techniques. Considering the necessity of customers we also customize these products and offer them at market leading price. Looking for Bucket Elevator Conveyor ?